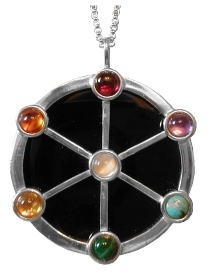 Widdershin's offers a Magickal collection of Sterling Silver Scrying Pendants. Silver and Onyx, these pendants are portable scrying tools. Includes 24 inch sterling silver chain and is approx. 1" x 3/4". These beautiful pendants are individually made in America and may take up to 4 weeks before shipping. The ancient art of clairvoyance achieved by gazing into an object for the purpose of divination. After choosing your scrying pendant, it should be cleansed. Sage - moonlight, whatever works for you. Wear it for a few days to release your personal energies into the stone.